KandilaFx is the Expert Advisor for a successful trader. 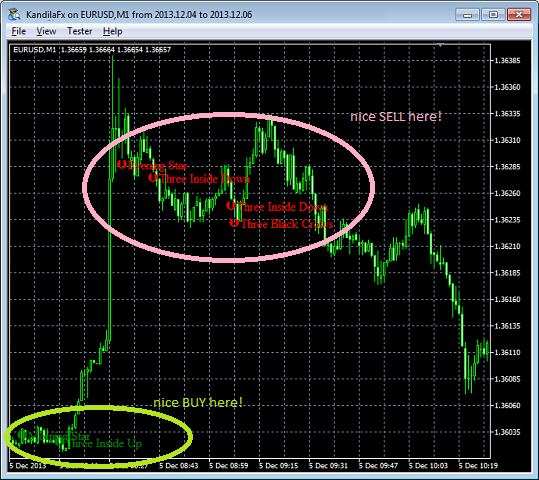 KandlilaFx does not control the master but helps its master to be an good trader. It gives good hints to its user when to buy or sell. KandilaFx cannot be used to trade automatically. A user should have basic knowledge in Japanese candlesticks patterns to use KandilaFx successfully. The candlestick patterns included in KandilaFx are commonly used on Forex by most Price Action traders. KandilaFx purely relies on the power of candlestick patterns and the user can still use it together with his favorite indicators, oscillators, trend lines, etc. There are few products similar to this one and they have a very high price and difficult to configure. KandilaFx is unique in its simplicity, colored captions for bearish/bullish candlestick patterns will tell the trader when to buy or sell. Note: if you know nothing about Japanese candlestick patterns, DO NOT USE KandilaFx!! !